The NTG-2 provides a balanced low impedance output stage and operates either from an internal 1.5 V battery (AA) or 48 V Phantom power supplied by your audio recorder. This mic has a wide bandwidth and controlled polar response coupled with low noise SMT electronics, making the NTG-2 the perfect choice for film, video engineering and voice-over work. The NTG-2 is extremely lightweight making it ideal for mounting directly to video cameras or on boom poles. The mic comes with Rode foam windshield and can be complimented with a Rode deadcat and other audio accessories like a boom pole or shock mount. 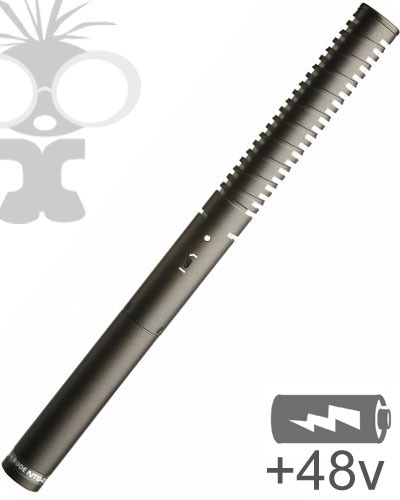 The NTG-2 is designed to operate from standard P48 phantom power or a 1.5 V Alkaline Battery. The NTG-2 will operate between 44 V to 52 V applied with positive polarity to pin 2 and pin 3 via the output XLR connector. The NTG-2 will operate satisfactorily into a load impedance as low as 1kohm. If a load below this is used, the output signal level will be reduced. The NTG-2’s output is balanced between pin 2 (hot) and pin 3 (cold). Pin 1 is ground.